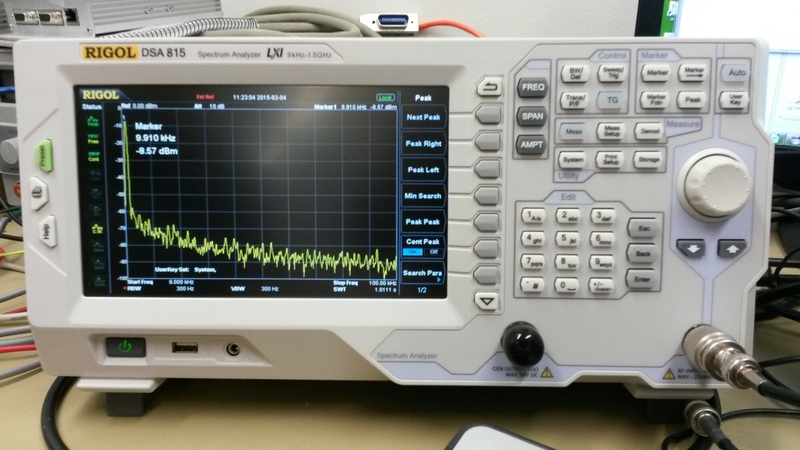 I have already written a few posts on AD9850 DDS testing. Here are some more testing. 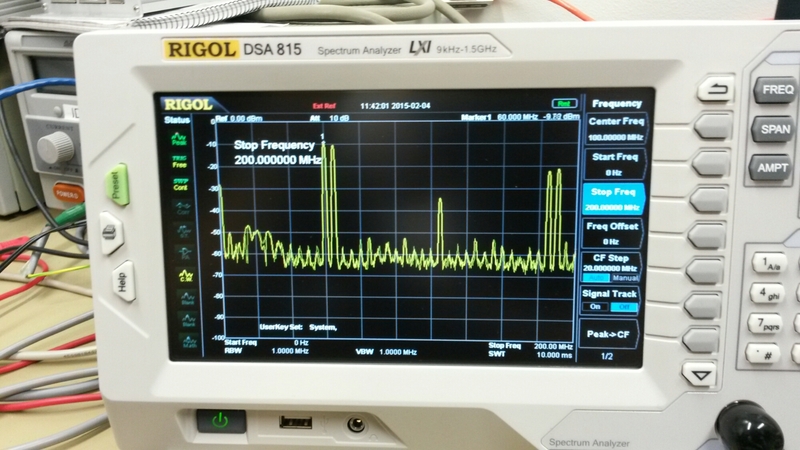 I had possibility to test my signal generator circuit with Rigol DSA 815 RF spectrum analyzer. I improved my test circuit from previous tests by putting it inside case. I also replaced Arduino UNO with Arduino model with FTDI USB interface IC that works on modern Windows PC without need to install extra drivers. Here are some measurement results. Signal seemed to be quite clear up to around 30 MHz, and with somewhat more harmonics up to promised 40 MHz. The IC seemed to give out some signal up to slightly over 62 MHz (quite much harmonics at highest frequencies). This video explains how to use the tracking generator (TG) option of a spectrum analyzer to characterize a filter. 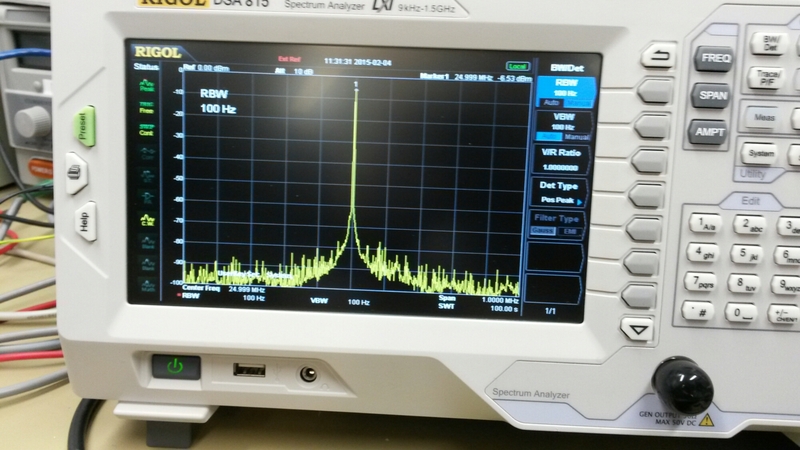 Many product designers and EMI engineers are using the popular Rigol DSA815 spectrum analyzer for EMI troubleshooting and pre-compliance testing. I’d like to demonstrate the instrument settings and measurement features I most commonly use when troubleshooting radiated emissions in the 30 to 1000 MHz region. You’ll find these useful for either near field probing or testing emissions using a nearby EMI antenna. The network analyzer shield uses an Analog Devices AD9851 DDS chip clocked at 180MHz which will output a sine wave at any frequency from 0Hz and 72MHz. The DDS output is filtered with a Butterworth LPF and then passed to a two transistor amplifier. The shield will output approximately 0dBm (maybe 1-2dBm if you turn the Pot up; may get distortion, though) into 50 Ohms. The output and input connectors are SMA. The power detector is an Analog Devices AD8307. It’s inputs are terminated with a 50 Ohm load. There is no filtering on the input of the power detector so the chip is responsive from very low frequencies all the way up to 500MHz. 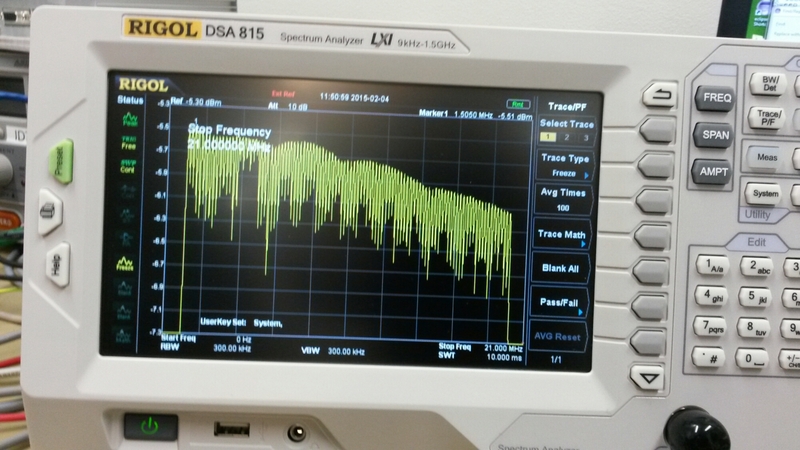 OpenGen is a DDS waveform generator which can generate sine and square waves put to 42.5MHz. It is in a rugged handheld case and has a built in power supply and Arduino-compatible microcontroller to allow it to function independent of a PC. 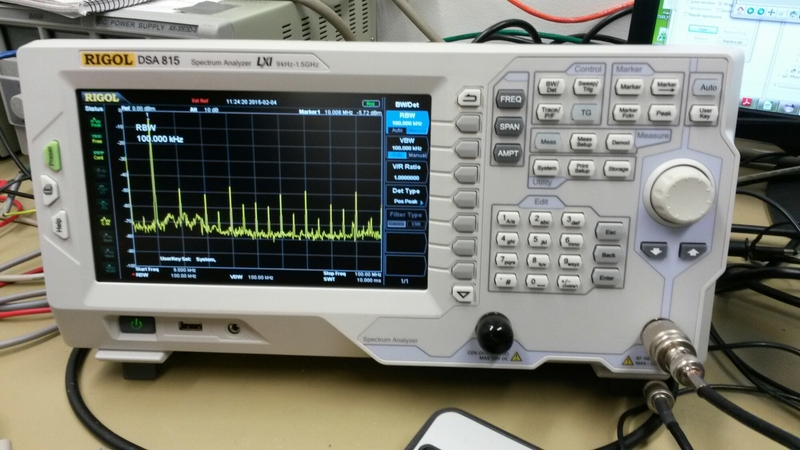 OpenGen can output sine and square waves from 3kHz to 42.5MHz in increments of 0.0291Hz. The square output triggers from the sine so they cannot be different frequencies. 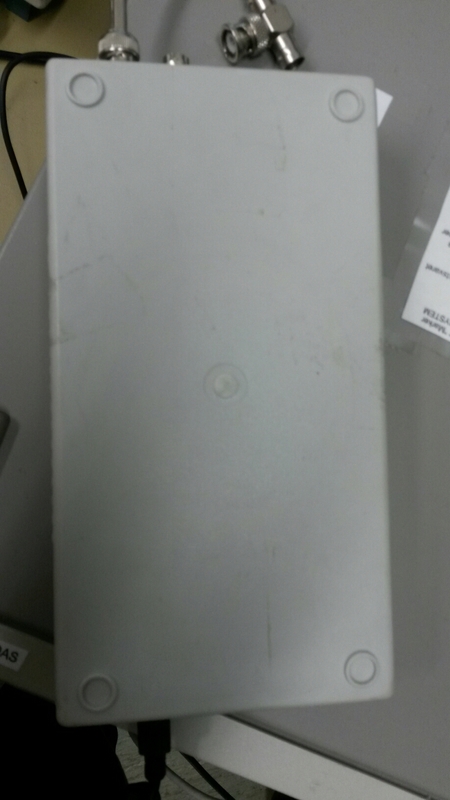 There is a load switch (pushbutton controlling a relay) for each output to disconnect a load easily. The analog parameters (sine amplitude & offset, square duty cycle) are adjustable to an 8-bit resolution (2^8=256 steps). 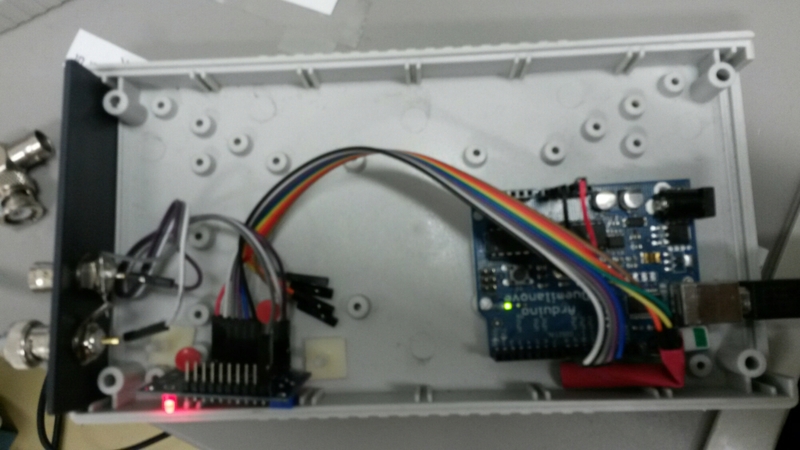 popular AD9851 DDS module from Ebay is shown connected to an Arduino UNO via the Picotest J2130A DC blocker. 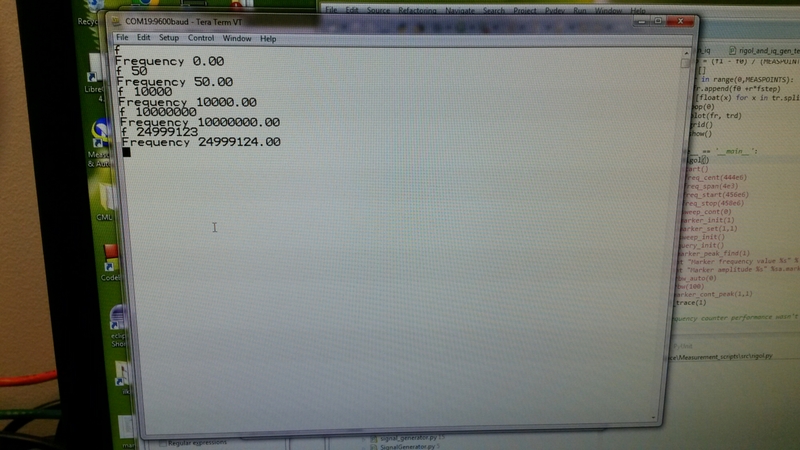 The Arduino is used to set the output frequency of the AD9851.